The Honourable Peter MacKay, Minister of National Defence; Blake Goldring, Chairman of Canada Company  and Chairman and CEO, AGF Management Limited ; along with Rear Admiral Andrew Smith, Canadian Forces Chief of Military Personnel; today presented scholarships to eight surviving offspring of fallen Canadian Forces  personnel. The scholarships are provided as a tribute to fallen Canadian Forces personnel by a charitable business group called Canada Company. Each recipient will receive up to $16,000 each – up to $4,000 per year for up to four years – to help defray the costs of their post secondary education. The third annual awards ceremony was conducted aboard the HMCS Frederiction . 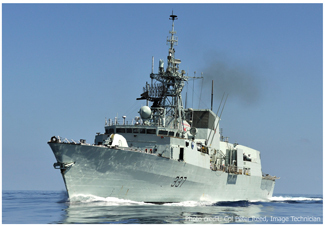 The Halifax-based frigate is currently on a five-week Canadian tour, including seven port visits along the St. Lawrence Seaway and the Great Lakes. * Robert Girouard of Orillia is studying Law and Justice at Laurentian University. * Kirsten Hess-von Kruedener of Burlington is studying at the RCC Institute of Technology Interior Design. * Sheralynn Kennedy of Winnipeg is attending the University of Winnipeg working towards a doctorate in Psychology. * Matthew Mellish of French Lake is attending the University of New Brunswick. * Myriam Mercier of Quebec City is studying Nursing at Cegep de Sainte-Foy. * Adam Naismith of Moose Jaw is studying Arts and Sciences at the University of Saskatchewan. * Jocelyn Ranger of Pembroke is studying business at Algonquin College. * Natasha Roberge of Hamner is studying English and Music at Laurentian University. The Canada Company Scholarship Fund provides $4,000 per year, for up to four years, to support the post-secondary education for children who qualify. Children of Canadian Forces members who have died on duty while serving in an active role in a military mission of the Canadian Forces or reserves since January 2002 are eligible to apply. The Canada Company Scholarship Fund will provide scholarship grants to children dating back to January 1, 2002. Canada Company scholarships have received leadership funding in the amount of $1 million from CIBC. Additional financial support was secured from Power Corporation; Peter Munk, Founder and Chairman of Barrick Gold Corporation; Jim Balsillie, Co-Chief Executive Officer of Research In Motion (RIM); RBH Inc.; The W. Garfield Weston Foundation; The TD Bank Financial Group, BMO Financial Group; Scotiabank; Standard Life; Laurentian Bank of Canada / B2B Trust and AGF Management Limited. Canada Company is calling on other members of the corporate community to contribute to this important initiative. Canada Company oversees the fund through an independent committee, along with members of the Canadian Forces, to ensure that bereaved children have the opportunity to receive this scholarship. One way which you can show your support for Canada Company Scholarships is to take part in the upcoming North American Van Lines Tour de Force , an exhilarating cycling trip through southern Ontario and Quebec. The bike/run will kick off at the Air Canada Centre in Toronto with celebrities in attendance including players from the Toronto Maple Leafs and former NHLer’s and will last for seven days ending in beautiful downtown Montreal. The trip will be broken down into seven 85-kilometre intervals. Cyclists can register for the entire trip or certain legs of the journey. At the end of each leg of the trip there will be a celebration in the evening. editor’s note: While this article may not be directly related to Canada’s digital media industry, it is directly related to a game we all play every day: life. As a military family and supporters of our Canadian Forces, from time to time we carry related stories. We hope that you will join us in supporting those who serve our country now and in the future, and in remembering those whose patrol has ended.